We have been enjoying the luxury of watching HD live video in the comfort of our home direct feed from Kanchipuram – Adishtanam & Orikkai almost 5 times a month. 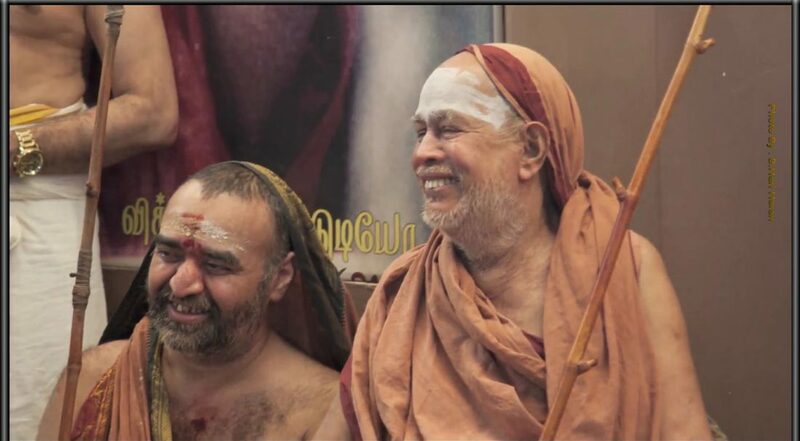 Recently, when HH Pudhu Periyava attained siddhi, they streamed non-stop 36 hours of video from the Matam. What a luxury for all of us! I have seen that for a normal Pradosham / Anusham, there are at least 200 concurrent viewers. For Periyava siddhi, I was told that they had thousands of concurrent viewers watching from all over the world. Shouldn’t we all know the people behind and thank them for their hardwork? Hence this post. I’ve been asking Sri Kumar to send a group photo of the whole crew for quite some time. Due to logistics reasons, they couldn’t get one. Instead, I got individual photos. Meet this team, who are selflessly working as a pure kainkaryam to Sri Matam. Sri Kumar was in tears and couldn’t talk when he was describing about how selflessly these people worked all the 36 hours on those two days. All of them did not eat anything for more than 16+ hours. After compulsion, they took a cup of tea – thats all. Balaji was describing about the cameraman who was standing right behind Periyava throughout that night and he was barely able to get out even to use restroom. Due to some logistics reason, the Matam were not allowing people without passes and unfortunately, this crew were not given those passes. All these folks (except Kumar Anna and Balaji) are independent video professionals, who primarily do marriage kind of events and they all are doing this only for two reasons (1) Periyava (2) Sri Kumar. Due to the fact that this is a kainkaryam, these noble souls are working at a much discounted cost for Sri Vignesh studio. As we all know Sri Kumar’s devotion to Sri Matam is unparalleled and his guru bakthi is beyond imagination. I learn a lot every time I talk to him – he tells me something new every time. Vignesh studio team – on behalf of the blog and all other online viewers, a very big thanks to each one of you for your work and helping us to get as close to Periyavas and be in their smaranai all the time. Pl call Sri Kumar Anna (+91 94443 25344‬) and thank him for this service – that would be the least thing we can do from our side. Thanks and namaskarams to Vignesh studio team .jaya jaya sankara hara hara sankara. Our HEARTFUL THANKS to all the Team. Jeya jeya Sankara Hara Hara Sankara. Namaskarams…Our namaskarams to the entire team of Sri.Kumar..
selfless silent devotees Many namaskarams.Periyava bless each and everyone of them abundantly.–laxman. Namaskarams.. What is the phone number of Sri Kumar Anna? Mahesh Garu, ‘Thanks’ would be a small word to say for the selfless work they have done for Sri Matam eventually that benefitted lakhs of viewers across the Globe. I pray their prosperity in terms health and wealth in their future endeavors. Many many thanks Team Vignesh. May the Periyavas Bless you all individually and collectively for the great service which bruoght us closer to the Periyavas. anneka koti thanks and namaskarams to each of the team member. un-interupted, all for free. Its my humble opinion that we should contribute in a small way as a token of our appreciation for their services. Thanks a lot team and thanks to Mr Mahesh for bringing out this wonderful videos to all of us. namaskaram . my immense thanks. how do i get the contact of shri kumar please. Thanks to the Vignesh team for a wonderful job and well done. It was a luxury to sit at home and watch the events at the Sri Matam. The members of the team have been doing the service which is unparalleled. Big thanks and Namaskarams. we pray for the welfare of their family. Pranams to Mahaperiava. It is not sufficient to mention ” Tons of Thanks” these self less persons. Maha periyawa and pudu periyawa bless them. Thank you for taking the ‘thank the team’ initiative. It was well deserved. Hats off to them. I think you should mention each team members’ name alongside the photo so we can connect a name with relevant the face.It will help thanking them in person when we run into them.